Saje In-House Natural Food Specialist Anna keeps things fresh with tips on how to use this zesty citrus, including a vegan dessert recipe. Just when we thought summer would never come, the cloud are drifting away and the sun is starting to shine. An aroma that always seems to bring to mind the lazy, hazy days of summer is a household staple: lemon. From a childhood favourite, lemonade to a zippy way to clean your kitchen, this fruit version of ‘liquid sunshine’ is bursting with flavour, nutrients and possibilities for use around the entire kitchen. 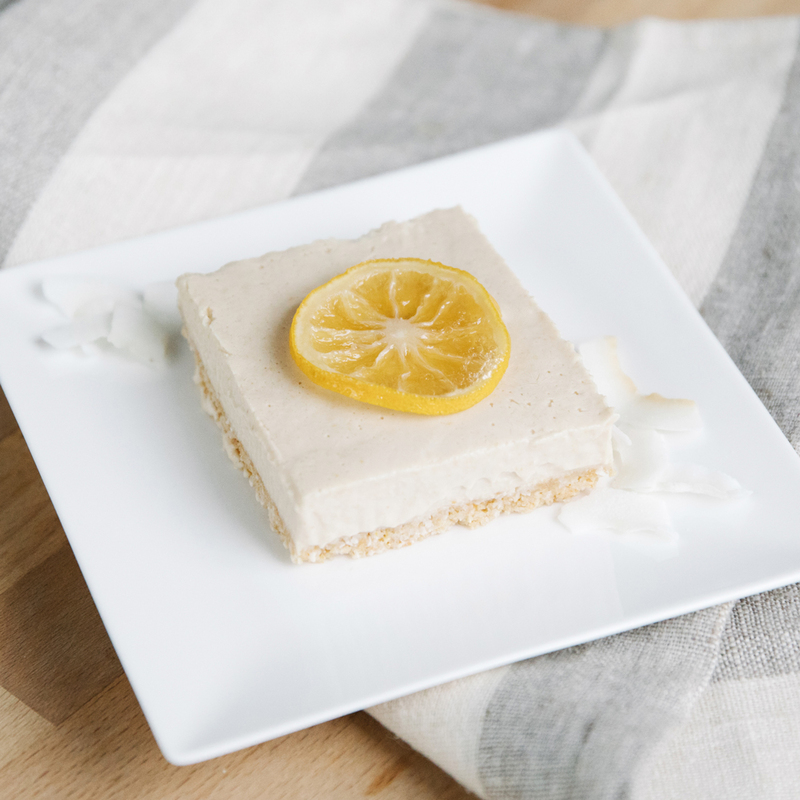 Anna, our natural food specialist, shares her love of all things lemon, including a vegan-friendly recipe. Where to begin with lemon? The great thing is: you can start anywhere with this versatile little citrus fruit that packs a vitamin and flavour punch. I can’t get enough of the sunny taste of lemon and never leave the market without at least two more in my grocery tote. Lemon is one of those key pantry staples that seems to make just about everything better. This bright yellow fruit is part of the larger citrus family that includes more of our go-to fruits, like oranges, limes, grapefruit, pomelos and mandarins. The lemon tree, a flowering plant with thorny branches and white flowers, is actually a hybrid of lime and a rare fruit called citron. Although native to Asia and grown around the world, the top lemon-producing countries are Brazil, China, the United States, Mexico and India. What Does Lemon Taste Like? Have you ever given a slice of lemon to a baby? One look at their little puckered-up face tells you this: lemon is sour! The taste we call sour is one of the five main taste profiles that happen in all food: the others are sweet, bitter, salty and savoury. In lemons, the sour taste happens because of lemon’s low pH level. The pH scale ranges from 1 to 14, with pure water sitting at a neutral level 7. Everything below 7 is considered acidic (such as milk, vinegar and, of course, lemons), while everything above is alkaline (such as avocados and bananas). Since our bodies are composed of 70% water, it makes sense that our ideal pH hovers around neutral (though, in reality, we’re slightly more alkaline). All of our body’s systems—from circulatory to nervous to immune to reproductive—depend on a balanced pH level. Maintaining a balanced pH level is essential to optimum wellness. So where do lemons fit in? With a pH level of 2, lemons are extremely acidic. (For perspective, battery acid is a level 0 and acid rain is a level 4). But something magical happens when you eat lemon: instead of creating acidity in the body, the citric acid metabolizes and becomes an alkalizing, pH-balancing superfood. No matter where in the world you go, you’ll probably stumble on a use for ginger. And, as more regional dietary systems make their way into our North American diet, we’re seeing ginger sprouting up everywhere. How Is Lemon Good For Me? The better question is how isn’t lemon good for you. It contains plenty of health-boosting elements such as vitamin C, vitamin B6, vitamin A, vitamin E, folate, niacin, thiamin, riboflavin, copper, calcium, iron, magnesium, potassium, zinc, phosphorus, protein and pantothenic acid (B5). Here’s a few of the key ways lemon can add zest to your overall health and well being. Vitamin C: Vitamin C is an antioxidant that protects cells from damaging free radicals, boosts the immune system and helps maintain skin’s elasticity. Our bodies do not produce vitamin C naturally, so we need to get this vital nutrient through food and supplements. Potassium: Potassium is a vasodilator, which means it dilates blood vessels and allows more oxygen to reach the brain. This dilation action stimulates neural activity and increases cognitive function. Potassium also stabilizes blood sugar, helps prevent cramps, and assists in bone and muscle maintenance. Digestive Aid: Lemon juice mixed with water helps relieve digestive discomfort like indigestion and constipation. The pH in lemon works to get things moving in the digestive system, while the water acts as a lubricant to soften stool. Diuretic: Diuretic foods help you naturally release water which helps reduce bloating. Lemon is a natural diuretic that helps flush out the body. I love using lemon in everything from cooking to cleaning. It’s a powerful flavour booster, a natural deep-cleaner, and its bright, energizing aroma can freshen your home. Here are a few of my favourite ways to use lemon. Prevent oxidation: Citric acid from lemons helps prevent fruit and vegetables from turning brown after you cut them. To help fruit and vegetables last longer, slice and add to a bowl of water and lemon juice. Do the same with tired-looking lettuce: pop in in some lemony water, toss it in the fridge and the leaves will take on a new, crispier life. Make a tonic: Brew an ayurvedic tonic by simmering lemon with filtered water, gut-healing ginger and maple syrup. Enhance flavour: Squeeze lemon on roasted vegetables like fennel or add to guacamole to make the flavours pop. Lemon can kick any recipe — from dressings and garnishes to juices and desserts — into high gear. Save the rind: Before you toss a lemon rind in the compost, use it to refresh kitchen surfaces. Scrub cutting boards, butcher blocks or your sink to keep things fresh and clean. Keep things fresh: Lemon is a natural deodorizer. 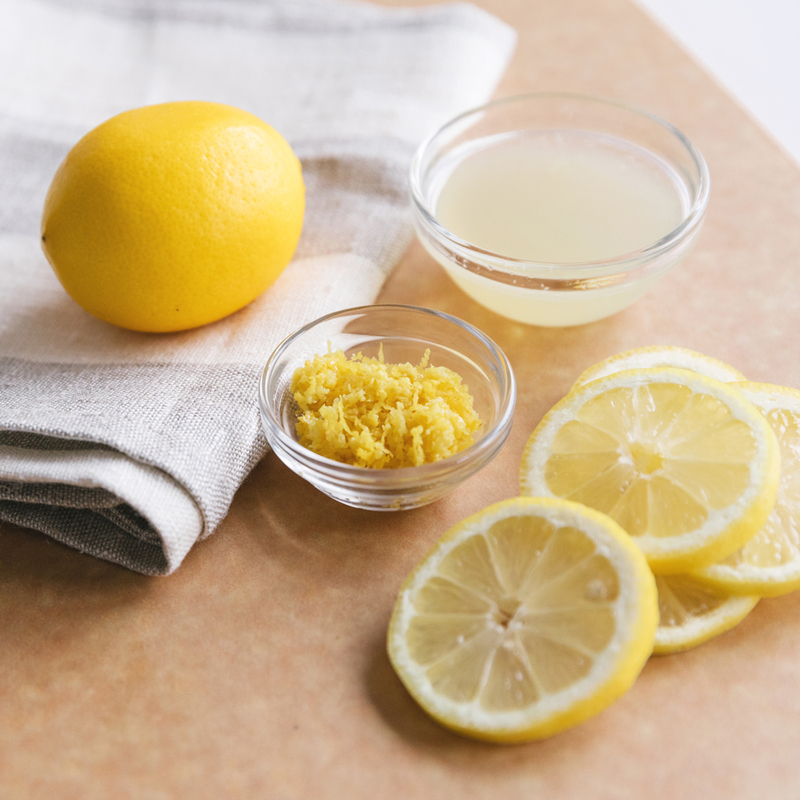 Place a lemon peel in your fridge, trash can, or dishwasher to refresh odor-prone areas of your home. But really, one of my favourite ways to use lemon is, of course, in recipes! Satisfy your sweet tooth with this vegan-friendly, gluten-free, sugar-free indulgence that looks as good as it tastes. Enjoy! To make the crust, add unsweetened shredded coconut, raw cashews, maple syrup, vanilla and salt to a food processor. Pulse until cashews are fully broken down and mixture starts to resemble a crumbly dough-like consistency. Line a 9x9 baking sheet with parchment paper & add crust mixture. Press the mixture down with your fingers or with the bottom of a water glass until evenly distributed. Put pan aside. For the filling, add cashews, coconut cream, cornstarch, lemon juice, lemon zest, maple syrup and sea salt to a high-powered blender. 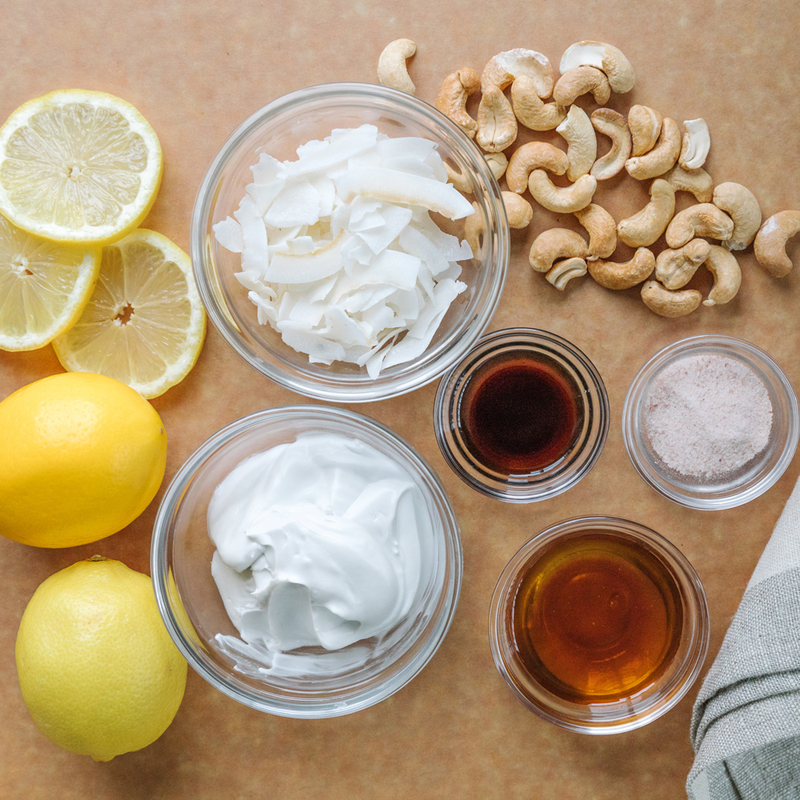 Mix until the mixture is creamy and the cashews are completely incorporated. Pour filling onto the pressed crust and tap the pan on the counter a few times to get rid if any trapped air bubbles. Cover and freeze for 8 hours or overnight. 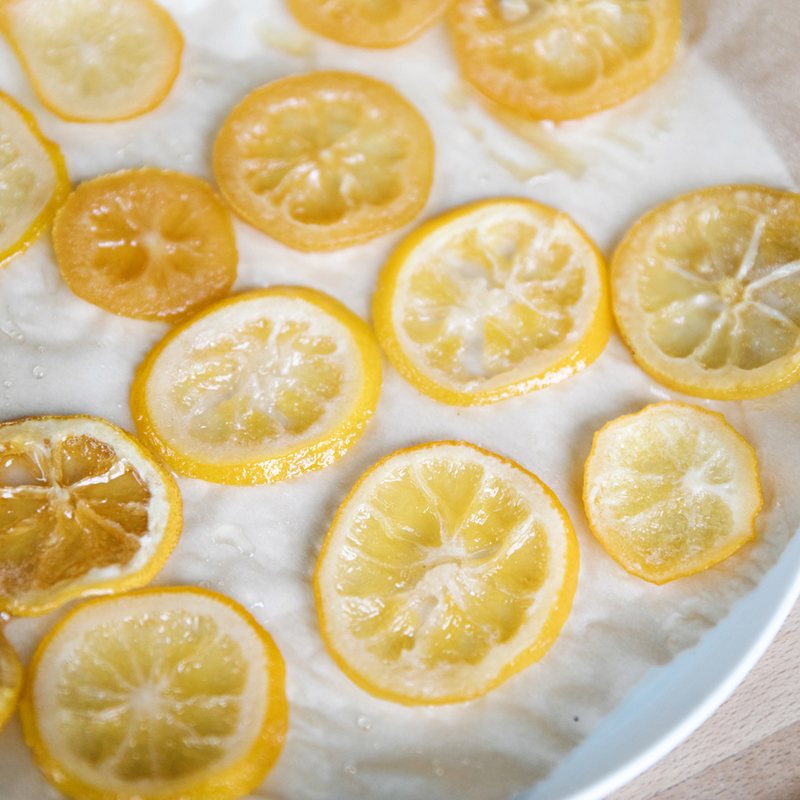 Once water is boiling, add meyer lemon slices and turn down the heat to medium-low. Simmer for 10 minutes. After 10 minutes, gently take out the lemons and put aside. Drain lemon water, leaving approximately ½ cup in the saucepan. Add sugar to the lemon water and stir over medium heat until all sugar granules dissolve. Add ½ of the lemon slices and cook for 8-10 minutes. Make sure the mixture does not boil. Once lemons start to look translucent, remove from the saucepan & let them cool on a parchment-lined plate. Repeat with the second half of the lemons. Store lemons in the fridge until you’re ready to serve on top of the bars. Once bars are set, or when you’re ready to serve the next day, take bars out of the freezer and let them sit at room temperature for 45-60 mins. Once the bars become softer, cut into squares and top with a candied Meyer lemon slice. If you prefer a firm texture, you can serve them immediately out of the freezer. At Saje, we’re all about finding natural ways to heal the body. This means focusing on what we put in our bodies just as much as what we put on our bodies. Lemon is an easy, effective and delicious way to heal your body from the inside out. And remember: when life throws you lemons, you can do a whole lot more than make lemonade!